Measurements approx. 50 x 75 cm (20" x 30"). Best laundry bag I have and ever will own. Perfect for weekly laundry. Expected it to be larger somehow, even though the dimensions are listed here. My loads of laundry aren't small, so I'd need two or three for a weeks worth. Good quality , though plan to replace the drawstring! Got a bunch, use them for various stuff, even storing vegetables. Accidentally ordered two, they turned out to be some of the best laundry bags I've ever had. Not very big, but very resilient and durable, perfect for dirty work clothes. Perfect for the job. Well made, like everything German. The three I received were in okay shape. Two had small holes that had to be repaired. And two were missing drawstrings. 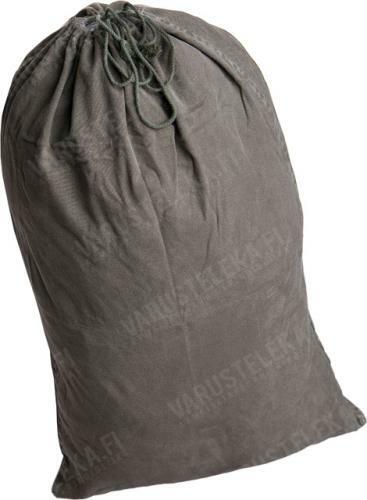 I contacted Varusteleka's customer service about the drawstrings, and they made things right.